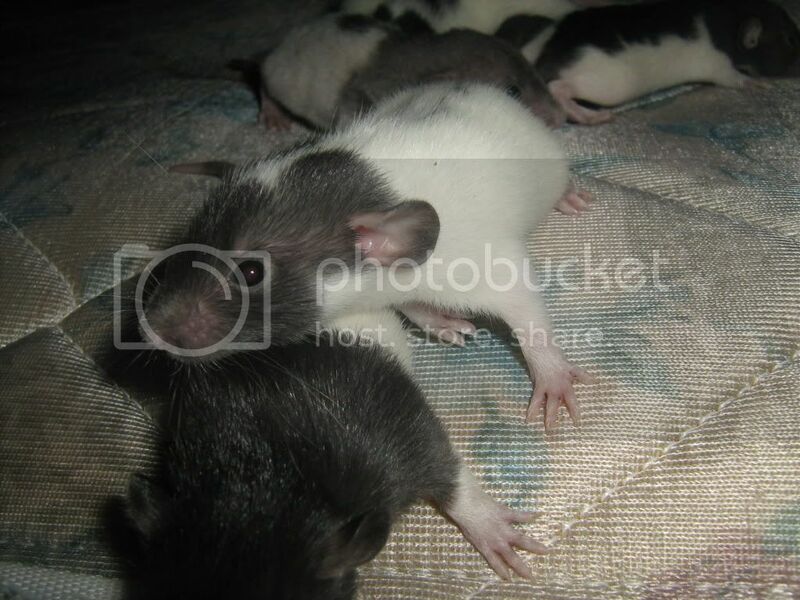 Small-Animals - Update on rat pups cchek out our cuteness!!! 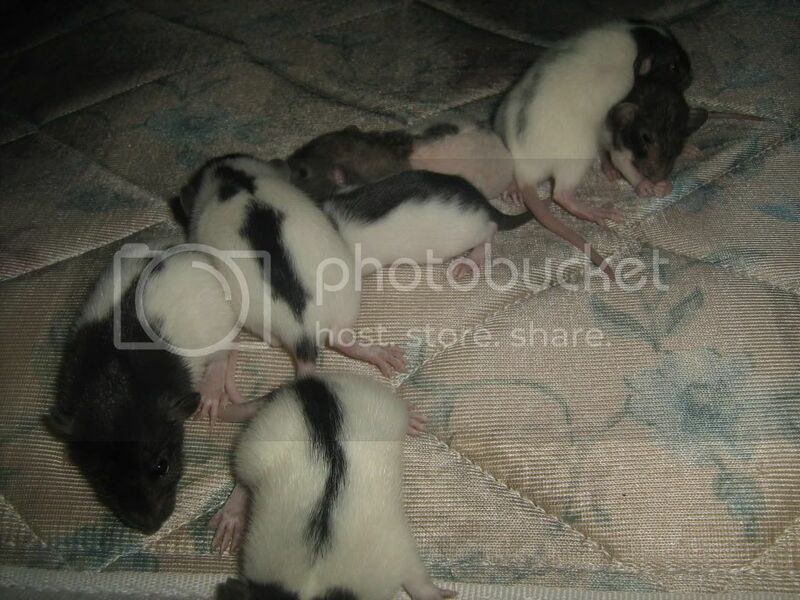 Update on rat pups cchek out our cuteness!!! i have a question to ask...do rats have a strong urine smell? 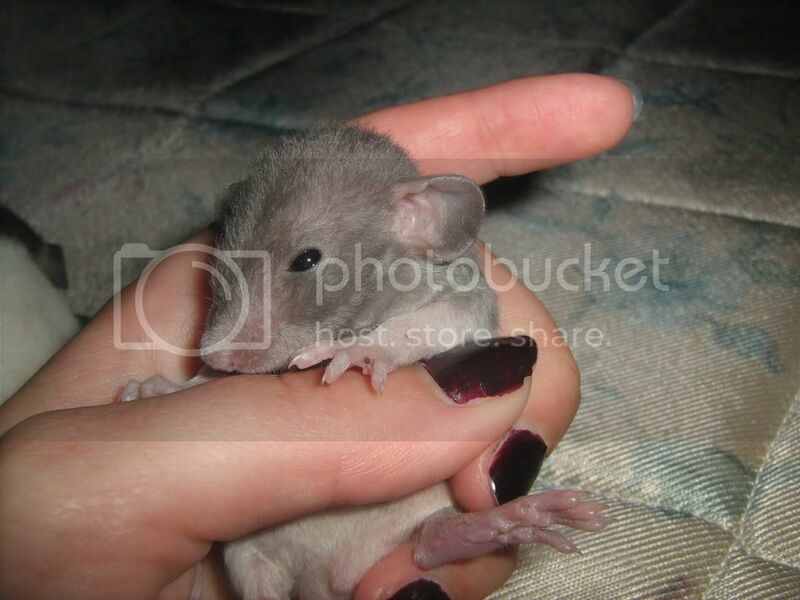 is it similar to mice? incase you still dont have a name for the baby thats nameless... here are a few cute ones: blaire, paz, louigi, ronaldo, havarti, momo, palaris, julian, mancala, walden, avey, cheerio, and pooter. okay.... well a cute thing to do is summarize the baby’s characteristics (the one without a name) then look up the greek gods (there are soooo many), just look up the god’s names and description, then match which god the nameless baby is most like. i dont believe in them or anything, its just that, i think that most of the gods have cool names. i have used this technique before...sooo cute. ahhah... welll goood luck with that!! hahahah alrighty then. ideas never hurt. :D good luck. i was just wondering if you had any older rats?... like not OLD.. but older that pups? 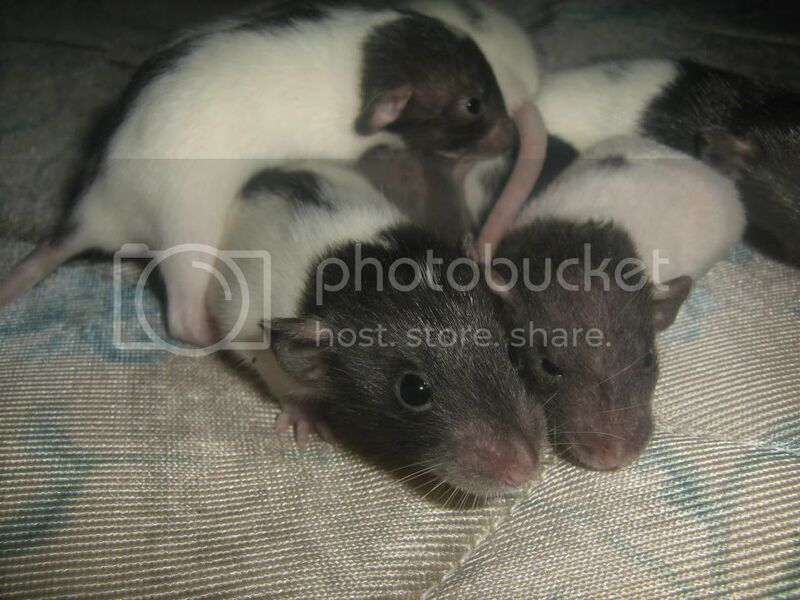 i am 14 and i hav had 2 rats before but i was WAYYYY more inexperienced and i had to give them up for adoption. but now i have done lots of research and i have seen how-to vids about rats sooo my mom said i could get 2 more. im plannin on gettin a dumbo and a fancy. im guessin u have plenty of knowledge about rats seeing you have had a litter so i was going to ask you a few questions. starting with... what kind of food do you suggest?.. i already know that i will need to give them fresh fruits and veggies. but what kind of lab block/pellets?... i read that ’mazuri’ is good. but what do your rats like? and alsooo.. do you give your rats a bath?... i no that some ppl say it isnt good for them cuz it washes the oils from their skin,but what do u think?. and also... do u leave urs on free range?... do they poop occasionally? cuz i already have ferret poop stains. i dont need anymore. well. thanks for anything you answer to. they love grapes and apples, bananas etc... and some veggies... (mine are picky) brown rice mixed with corn and a bit of turkey sometimes... some meats are good for them... like chicken and turkey.. but the white meat only. the dark is to fatty. As for the blocks, Mazuri is a good brand but expensive as heck.... kaytee is what i usually use,zupreem stuff like that. also nuts.. like peanuts as treats. i give mine a bath every two weeks or three. it helps keep their oder down. and depending on the shampoo you use ... keeps the fur soft and the skin moist so there is no infections like dry flakey skin. i never leave my rats free roam, we have cats and terriers which wouldnt hesitate to kill... that and rats poop everywhere and pee... especially males..
wow... are u selling any?... what area do u live in?.. i live in MS. and thanks for the info. i am gettin two rats this weekend. oh hahaah yaaa... well i just went today and looked at some pups at the local petshop. they are 20 dollars but they look 6 months. sooo i guess thats pretty good.... do you have any cages your not using?...send me one!! hahhh jk. i do need to get a cage though... and my mom is not helping me buy one cuz she said im doing this on my own since she has paid for all of my past pets. ..hahahh. hahah okay. im saving money already. i am gettin a multi level ferret cage. and all of the accesories. its gonna take awhile. ahhaha. uhhmm... how many rats do u have? what do you do with all of the pups? and wow, thats cool. a new litter?.. when is the momma expecting? they are snake food mostly, its cheaper to breed rats for my snakes then buy them. that and i also sell them as pets or as food for reps.
ohhhhh....ew. ...everyone has to eat though. are u going to put pics of the massive momma on here? the bigger the better, jsut make sure the bar spacing is not to wide... they are smart and can squeeze through anything. yeah it does look like that, or they are sumo wrestlers with a very bad additude lol. have you ever gotten "high whites" or babies with mea colon.. i dont fullly under stand how this works. does it have to do with the color of the parents fur? have you ever gotten "high whites" or babies with mega colon.. i dont fullly under stand how this works. does it have to do with the color of the parents fur? 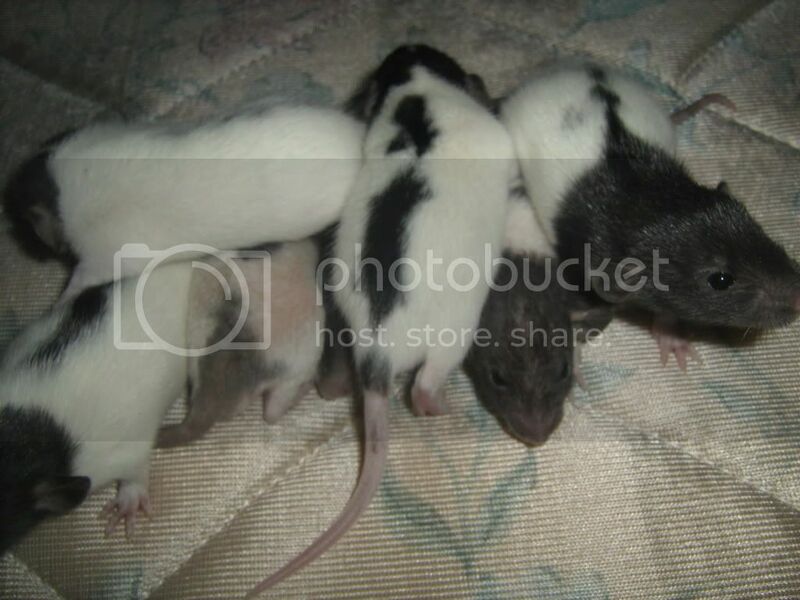 no idea, i have had rats with every color and patteren... hairless and nearly hairless,,, even patchwork rats lol. and even rats with odd eye (eyes with diff. colors) and never had an issue. but had babies with swollen stomachs/ intestines. lol it was not pretty.